Microsoft no longer carries inventory of the Kinect Adapter, which means that if you don’t already have one, your Xbox One S or Xbox One X console will not be compatible with the Xbox One Kinect Sensor. 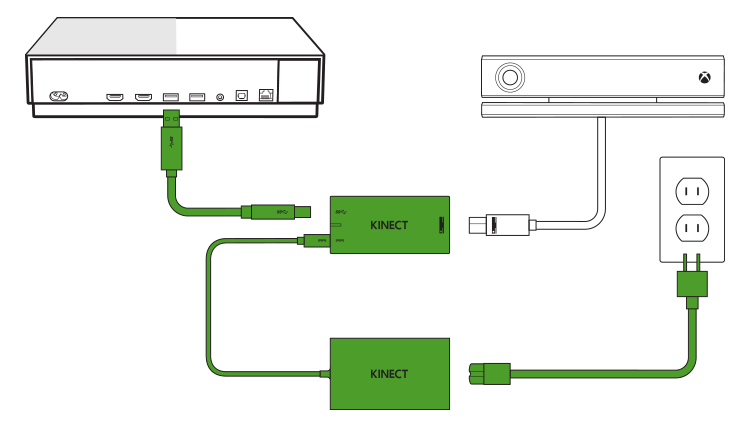 The Kinect Adapter lets customers connect their Xbox One Kinect Sensor to the Xbox One S or Xbox One X console. The Kinect Sensor and Kinect Adapter ceased manufacturing in November 2017. An offer for customers with a Kinect Sensor upgrading from Xbox One ended in March 2017. To contact Microsoft for support, visit https://support.xbox.com/en-AU/contact-us. Note: The Xbox 360 Kinect Sensor is not compatible with Xbox One. For best practice, make sure your Kinect sensor and Kinect Adapter are not sitting directly on top of your console. On your console, open the Guide and select System. Select All settings > Kinect & devices. Make sure the Kinect sensor is turned on in the console settings. Go to System > All settings > Kinect & devices > Kinect. Power cycle your console. Sometimes the connection between the sensor and the console needs to be reset. To do this, hard boot the console by holding down the power button for 5 seconds until the console shuts down. Disconnect the power supply from the console, and wait 1 minute before reconnecting and restarting the console. If the Kinect Adapter power supply light is not lit, there's no power getting to the power supply. Try another outlet or replace your adapter, if trying another outlet doesn't work.